Iran used a Star of David as a target for one of its ballistic missile tests last year, Israel told the United Nations Security Council on Wednesday. 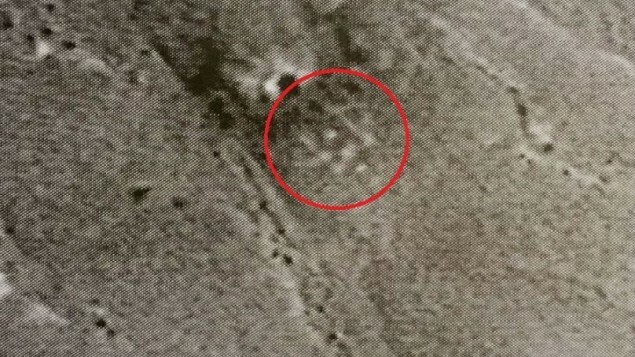 Israeli Ambassador to the UN Danny Danon distributed satellite photographs showing the target with a crater next to it, The Times of Israel reported. “The missile launch is not only a direct violation of UNSCR 2231, but is also a clear evidence of Iran’s continued intention to harm the State of Israel,” Danon said. In March of last year, Iran test fired ballistic missiles inscribed with the phrase “Israel must be wiped off the earth” in Hebrew. It wasn’t clear if the missile test described by Danon is the same one. This year’s observances of Quds Day were in line with Khomenei’s intent. “In his Qods Day statements, Lebanese Hezbollah chief Hassan Nasrallah, underscored the extension of Iran’s ‘Axis of Resistance’ in the Levant,” reported Amir Touraj, a research analyst at the Foundation for Defense of Democracies. “Nasrallah – who answers directly to Supreme Leader Ali Khamenei – threatened that a war between Israel and Lebanon or Syria would draw ‘thousands’ of fighters from Iran, Iraq, Afghanistan, Pakistan and Yemen. An Iranian general threatened last year that the Shiite army that Iran is creating will destroy Israel in 23 years.